Have you ever had to drag your way through a school year with tears and gnashing of teeth? Well I have. I mean, not literally gnashing of teeth, but you get my point. School was “boring”, “too hard” and frustrating ad nauseam. That makes for a hard year when everyone is ready to quit in October and you do not change things up! If you and your children are already dreading the school year coming up or just barely started (we start after Labor Day) now is the time to take a closer look at unit studies. Unit Studies bring back the fun to learning. My earliest memory of a unit study is our third grade history studies in public school. I was in Mrs. Bledsoe’s class, but for history I got to go over to Mr. Loveless’s class for a lesson in Indiana history. That year, we made corn mush (it was so much tastier than I expected!) took a field trip to the Lewis and Clark trails through Indiana, and made all kinds of fun projects related to history. But more then that, our exciting studies of Indiana history trickled into the other classrooms and subjects like handwriting, grammar, and literature and surprised us. It wasn’t the most all-encompassing unit study usually embraced by homeschoolers, but it was pretty awesome. Here I am still remembering that experience 38 some odd years later. Unit studies are pretty amazing. The next year in Mrs. Park’s class – we studied pioneer history and the great expansion out west. We built Conastoga wagons. Similar experience. I’m pretty much in love with this kind of learning because of my experiences in third and fourth grade. Notice that both of my examples of personal unit study experiences are from my own public school experience, but what I remember from those experiences is not specific knowledge but the projects and the fun. The cool thing is that every project I remember was teaching me something, whether it was a love of history, how to follow directions, spatial organization, fine motor skills, handwriting practice, gross motor skills, or project organization, unit study projects TEACH as the student enjoys the process. 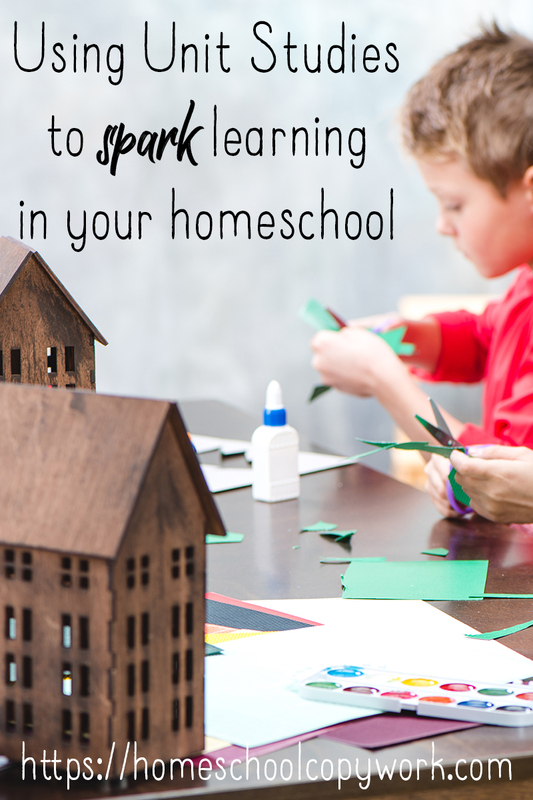 What makes unit studies work so well for homeschooling is the incredible amount of freedom you have at home. You can go further, cook more, explore more, take fantastic field trips, and exhaust all avenues of learning fun until you and your students are ready to move on. Unit studies make learning more fun! In your Homeschool Copywork Membership you can find fantastic copywork to fit into a variety of unit study topics! From dragons to Thanksgiving, we’ve got something that will work.